Price has moved in a very small range, mostly sideways. Both wave counts remain valid. The analysis is changed very little. Flat corrections are extremely common structures, particularly in fourth waves. Primary wave 2 was a rare running flat, and primary wave 4 may exhibit alternation if it is a more common expanded flat or a still common regular flat. Primary wave 4 may also exhibit alternation if it is shallow; primary wave 2 was very deep. Primary wave 2 lasted 53 weeks. It would be likely that primary wave 4 will continue for longer to be better in proportion to primary wave 2. It is most likely that primary wave 4 is not over and is unfolding as a large flat correction. Within the flat intermediate wave (B) is an incomplete double zigzag. Within the second zigzag of this double, labeled minute wave y, minuette wave (ii) may not move beyond the start of minuette wave (i). 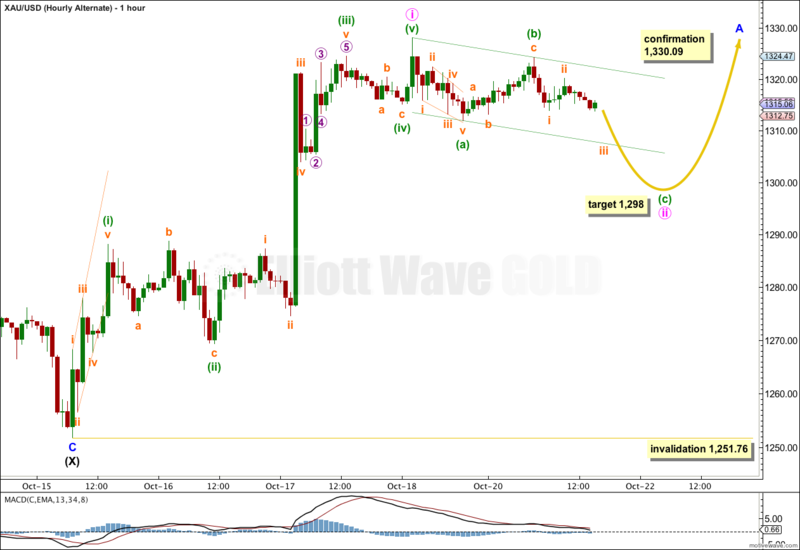 This wave count is invalidated at this stage and for some time yet with movement above 1,532.90. Within the flat correction intermediate wave (B) must be at least 90% the length of intermediate wave (A). This wave count requires more downwards movement to this minimum at 1,205.74. Within an expanded flat the B wave is 105% the length of the A wave, so this wave count allows for a new low as quite likely, because expanded flats are the most common type of flat. Intermediate wave (B) would be about three or so weeks away from ending. 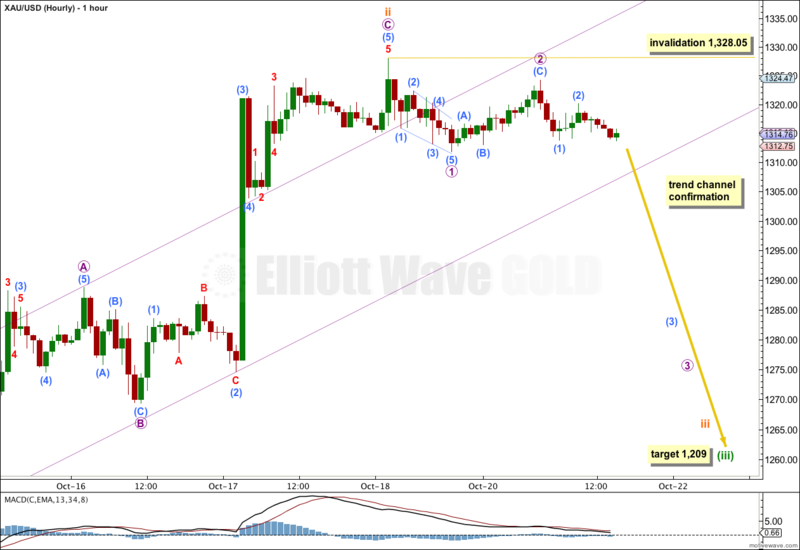 This wave count still does not have as good a fit as the alternate at the hourly chart level. Movement for the new trading week may be two first and second waves. If this is correct then I would expect strong downwards momentum over the next 24 hours. Micro wave 2 may not move beyond the start of micro wave 1. 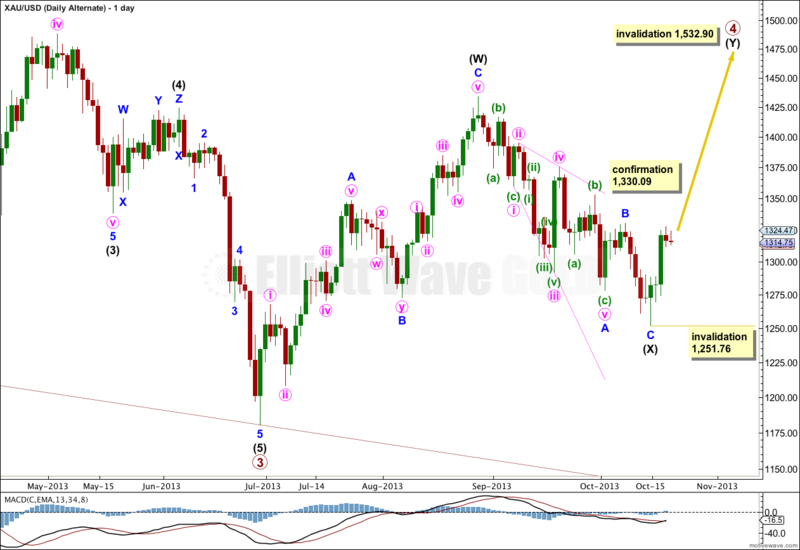 This wave count is invalidated with movement above 1,328.05. At this stage it is possible that Gold has completed its downwards wave and is in the early stages of the next wave up which would last at least a month. If primary wave 4 is a double zigzag, then within the double intermediate wave (X) may be complete. Within intermediate wave (X) minor wave A may be a completed leading expanding diagonal. However, within this structure the third wave is the longest, and minute wave ii is only 0.48 of minute wave i, less than the normal range of 0.66 to 0.81. These two problems reduce the probability of this wave count. Within leading diagonals the second and fourth subwaves must subdivide into zigzags, and the first, third and fifth waves are most commonly zigzags but may also be impulses. If one of these three actionary waves is an impulse, it is usually the third wave. Within the zigzag of intermediate wave (X) there is no Fibonacci ratio between minor waves A and C.
Movement above 1,330.09 would invalidate the main wave count and confirm this alternate. I expect that the upwards impulse ended at the price high and this may be where a second wave correction began. Within minute wave ii minuette waves (a) and (b) may be complete. Minuette wave (c) would reach 1.618 the length of minuette wave (a) at 1,298. This would bring minute wave ii down to the 0.382 Fibonacci ratio of minute wave i. Minute wave ii may not move beyond the start of minute wave i. 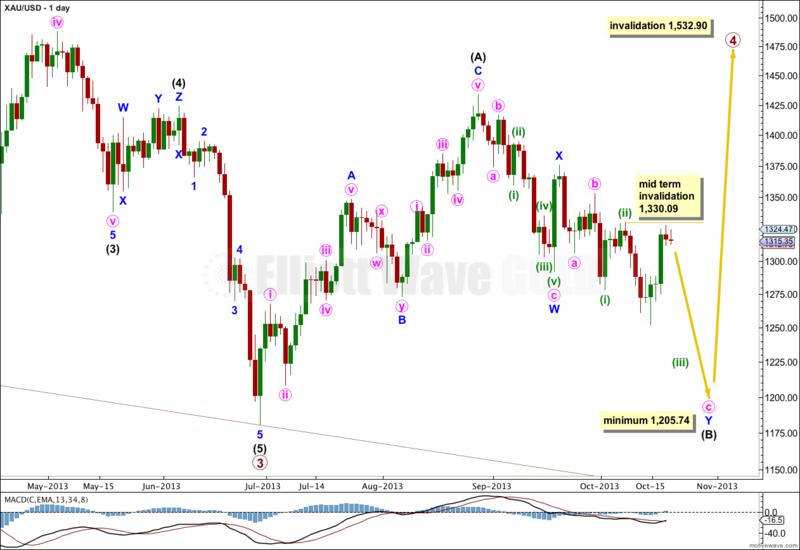 This wave count is invalidated with movement below 1,251.76.